The New Thessaloniki Railway Station (Greek: Νέος Σιδηροδρομικός Σταθμός Θεσσαλονίκης, Neos Sidirodromikos Stathmos Thessalonikis) is the central passenger railway station of Thessaloniki, Greece. Inaugurated on 12 June 1961, the passenger station replaced the old and much smaller passenger station which now handles the city's cargo rail, hence the name "new railway station" which has stayed on since. Although unchanged since the 1960s, it remains the largest and busiest railway station built in Greece. The Thessaloniki-Belgrade Express waiting to depart the station in 2010. For the metro station, see Neos Sidirodromikos Stathmos metro station. The New Railway Station currently features large waiting areas, a central hall, cafes, restaurants and a shopping centre. Discussions are underway for the expansion of the station and a general overhaul, which will also include a hotel and a revamp of the central offices of the OSE for northern Greece. A metro station is currently also under construction at the station. The passenger station started construction during the 1930s following an international architectural design competition that was carried out at the time and won by German architect Hans Kleinschmidt. His complete designs were never realised as they were later changed by other ar itects, but formed the base for what the station would look like. The main concrete shell of the building was completed before the Second World War, but construction was halted when Greece entered the war. Although the building was bombed throughout the early 1940s, it did not sustain heavy damage. Following the war, the station saw no development for over 20 years. In 1958 the project for the completion of the station was handed over to Greek architects Molfesi and Papagianni, who made changes to the original design by Kleinschmidt, and the project was finally completed and handed over to the public three years later, in 1961. The station has remained largely unchanged since that time, although minor additions have occurred, such as the construction of a shopping center adjacent to the waiting hall and the installation of escalators for access to the platforms. The most recent addition to the station is the construction of a metro station that is to form part of the New railway station complex. In February 2011, the station suffered a loss of importance given the suspension of all rail links to international destinations. In 2014, however, international connections were partially restored with twice-daily trains to Sofia, and the reinstatement of the over-night train to Skopje and Belgrade. The Filia Express to Istanbul remained suspended. Apart from the creation of a subway station, the Hellenic Railways Organization, which owns the New railway station, has announced its intentions to give a general overhaul to the station. The plans will include the creation of a 150-bed hotel and regional offices of the Hellenic Railways Organization. Until now, no official statement has been given on the matter. Currently, the only means of transportation to and from the New railway station are the public bus services of the Thessaloniki Urban Transport Organization (OASTH) and by hiring a private taxi. Line 78 of OASTH connects the railway station with Macedonia InterCity Bus Terminal (KTEL) and Macedonia International Airport. A Thessaloniki Metro station is currently under construction at the New railway station, which upon completion, will connect the train station with the city's metro network. The subway station is set to open in 2014. The station provides minimal parking space, although two new underground parking facilities, with four floors each are currently under construction as part of the Thessaloniki Metro project. When completed, they will provide parking space for 450 and 600 cars respectively, with a total capacity of 1050 cars. 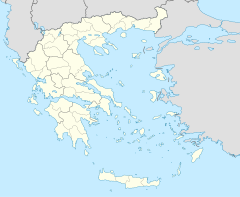 Wikimedia Commons has media related to Thessaloniki railway complex. ^ a b "OSE - 2017 Network Statement Annexes". ^ "Αναμόρφωσις Σιδηροδρομικού Σταθμού Θεσσαλονίκης" (PDF). 1961. Retrieved 14 April 2011. ^ "Αλλάζει ο Σιδηροδρομικός Σταθμός της Θεσσαλονίκης". Newsfilter. Retrieved 9 April 2011. ^ Επανέρχονται τα διεθνή δρομολόγια της ΤΡΑΙΝΟΣΕ από τις 10 Μαΐου (in Greek). Athens Transport. 28 April 2014. Retrieved 13 May 2014. ^ Ιστορικό (in Greek). 14 September 2010. Retrieved 14 April 2011.